The COIN-OR Foundation, Inc., is a non-profit educational and scientific foundation that was formed in March 2004 to manage the COIN-OR project. The COIN-OR project was first announced publicly at the 17th International Symposium on Mathematical Programming (ISMP) conference in Atlanta in the summer of 2000. It is governed by the COIN-OR Foundation by-laws. Support the establishment of open standards for data interchange and software interoperability. The Foundation is registered in the USA as a tax-exempt 501(c)(3) educational organization. The Foundation is run by a Strategic Leadership Board (SLB) and a Technical Leadership Council (TLC), both of whose members are elected by Full Members of the Foundation. Individual projects are managed by Project Managers, who report to the TLC. Full Membership in the Foundation is offered to those individuals who make substantial non-monetary contributions to the work of the Foundation, typically in the form of code, documentation, or other work. Full Members elect the Strategic Leadership Board and Technical Leadership Council. Any individual may nominate another for Full Membership in the Foundation. A nomination should describe the nominee’s contributions to COIN-OR and must be seconded by two current Full Members. That’s all there is to it. Nominations are accepted at any time and should be addressed to the Chair, Membership Committee. Corporate Membership and/or Corporate Sponsorship is available to institutions that make significant contributions (monetary or non-monetary) to the Foundation. These institutions are listed on our Corporate Members page. For more details on becoming a Corporate Member or Corporate Sponsor, please email info at coin-or dot org or contact any member of the Strategic Leadership Board. 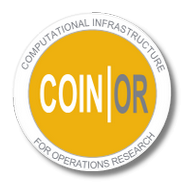 The COIN-OR Foundation recognizes the INFORMS Computing Society (ICS) as a strategic partner, and cooperates with the ICS in a number of ways, including co-sponsorship of many conference tracks and sessions. We are governed by the COIN-OR Foundation by-laws. A complete copy of the records of the Foundation, including by-laws and minutes, are located on the Foundation records page.